The short film kiskisiwin – remembering is an intervention in the mythic pioneer fables Canadians tell themselves at public history sites to justify colonial settlement while delegitimizing Indigenous claims to their own ancestral lands on Turtle Island. The logic goes something like this: if nothing or no one existed here before settlement, then it is okay that settler-Canadians exist here now. This kind of thinking is called terra nullius, Latin for empty land, and it is rampant in many public history sites in Canada. The text below outlines how I, along with Dr. Martha Stiegman and Dr. Anders Sandberg, used film and text to challenge this interpretation at Black Creek Pioneer Village. The materials we produced provide references to learn more about how these sites impacted me as an Indigenous person, as well as the lives of other Indigenous and non-Indigenous Canadians. Kiskisiwin from Doug Woods on Vimeo. In 2009, my wife Lucie had an assignment for Dr. Teresa Holmes’s “Anthropology of Tourism” class. Lucie had to visit and evaluate Black Creek Pioneer Village. Though I was basically an uneducated construction worker without much knowledge of critical thought, national narratives, settler hegemony, or whiteness, I tagged along and tried to help where I could. Lucie had a better grasp of these things. As we walked through the village we noticed that the history presented there was problematic on many fronts. It didn’t have 1860s Canada West things like gallows, brothels, police or soldiers’ barracks, or any Indigenous peoples. In her paper, Lucie noted all of these deficiencies and got an A+. Our visit planted within me a seed: why weren’t Indigenous people included in the site? The thought troubled me. By 2014, I too had found my way into a York University anthropology class, Dr. Sandra Widmer’s “Discourses of Colonialism.” Like Lucie’s class, it had an assignment involving a trip to Black Creek. This time we were asked to critically evaluate the public history on display. As President of York’s Aboriginal Students Association, in doing this assignment, I felt I had an obligation to really watch for the exclusion I noticed when Lucie and I visited five years earlier. With somewhat more education under my belt, I was shocked to see a glaring erasure of Indigenous peoples in virtually all of the village’s dioramas. It was much worse than I’d remembered. In fact, the only place where Indigenous peoples were included at all was in the gift shop in the form of cheap souvenirs visitors could buy. This is no surprise to anyone, I am sure, as most public history sites in Canada relegate Indigenous people to the safety of the gift shop, while the “real” settler history of southern Ontario is reserved onsite for Anglo “whites” only, especially if it represents the 18th and 19th centuries. When I came to Pioneer Village in 1984 that suspicion went away for a moment—I could be just another Euro-pioneer and break the land, farm and fish, just like all my other classmates. However, and sadly, I do remember one kid saying to me with a smug grin on his face: “This isn’t for your kind of people.” All the kids laughed and I remembered being hurt but I didn’t understand what he meant so I just disregarded what he said and tried to enjoy the rest of my visit. His comment, however, remained with me throughout my life. Now that I am older, I realize that his words did have a subconscious impact on me and, in its small way, had contributed to my later addiction issues. Unfortunately, it was just one of the many instances of where I felt marginalized by “Canadians” and “their” exclusionary discourse. When I came back to Black Creek in March of this year and viewed the site through somewhat trained anthropological and historical eyes, I could see that snotty kid was right. Black Creek is not a narrative written for my “kind,” there are no First Nations/Métis representations in your realist dioramas despite the fact that my people helped Europeans to survive in North America initially. The systems of knowledge associated with land subsistence are vast and take generations to learn in any environment. There is no way European immigrants to North America—the Stongs and others like them—would have known how to live here over the course of one winter without help from Indigenous people—period. Black Creek’s realism takes on even darker tones when one realizes the Anglo-foundation narrative you are presenting is aimed at children and sold as “truth,” leaving many young minds convinced that this area did not have “Indians,” and that no one lived here prior to the Stongs. This historic revisionism remains with them their whole lives and informs how they interact with First Nations people—treating them like just another subset of immigrant “ethnics.” Moreover, the terra nullius (empty land) discourse this is associated with is ignorant, destructive, as well as completely false as Ontario has been continuously occupied by First Nations people since the last ice age, 12 000 years ago! I could go on at length as to which First Nations people lived around the Toronto area at what time but for the purposes of this letter I will only impart that the last First Nations people who lived here were the Mississaugas of the New Credit. The Mississaugas lost the land now encompassing the GTA to underhanded Upper Canadian bureaucrats who underhandedly signed unfair and unjust, and now proven, illegal treaties with Mississaugas Chiefs on the 1778-79 Toronto “purchases” and 1805 Toronto “Confirmation” and that is how the land was freed up and “given” to the Stongs. Upper Canada land was certainly not free, empty, nor wild—these are Euro misconceptions. Thousands of years of wildlife management and land stewardship in Ontario had created a hearty symbiotic hunting and fishing ground that served the needs of First Nations people; it merely appeared “wild,” much like a well-manicured and rangered Algonquin Park does to us now. Furthermore, the concept of “Wild Empty Land” has Biblical connotations (Satan was thought to live in the “wilderness,” hence the Papal Bulls of the 1500s and 1600s designed to save savages from his trickery) and is tied to medieval Europe’s moral fetishization of cities. Lastly, the absurdity of terra nullius set to your Anglo realist foundation myth of Upper Canada denies the fact that Euro-agrarian settlement has only existed in Ontario for six maybe seven generations, while semi-sedentary First Nations settlement existed here for over five hundred to two thousand generations! To paint a better picture of Ontario’s long First Nations history imagine that the whole of human settlement here in North America neatly fit into one year—we’ll use the most conservative estimation of 12 000 years of First Nations habitation: Columbus would arrive in the “New World” at noon December 25, at 10:30 p.m. on December 27 Samuel de Champlain would found Quebec, and the Dominion of Canada would be founded at 2:00 a.m. on December 30 (The idea of putting the whole human history of North American into the chronology of one year belongs to scholar Sarah Carter, I just recalculated it for a more dramatic effect). When put in context, the realist discourse you employ—which narrowly focuses on the last few minutes of the last day of the historiographical year—to obliterate First Nations from their rightful place as co-founders of Upper Canada is, to use a colloquial term, a big fish story. Do not lose heart. Please continue reading, there is a point to all my historical revisionism—although it isn’t called revisionism when you’re simply telling the truth. 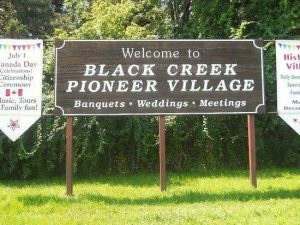 When Black Creek Pioneer Village was created in the early 1960s it reflected the majority values of Anglo-descended Canadians of that time. So, in a way, it isn’t your fault that the historiography you perpetuate is so incredibly myopic, racist, or anachronistic. We, your “noble” Indigenous super friends, forgive you—but we do expect you to change things. As well, I think you should be aware that Indigenous populations are the fastest growing demographic in Canada by leaps and bounds, even with massive immigration, so it is in your best financial interest to write us into your myth cause we’ll be the ones lining up and paying your gate fees in fifty years to see ourselves reflected in your realist colonial “mirror.” And I promise, if you start to include us now, when our Indigenous numbers overcome settler numbers—a real possibility if things keep going the way they are we won’t write you out of our foundation myth, you have my word on it. The decision to mail the letter, it seems, got lost in the turmoil of my undergrad. It’s not like I didn’t want to mail it, I just got buried in pow wow and feast planning, being ASAY president and all that entails, and trying to stay afloat amid the torrent of crappy undergrad papers I had to write. Near the end of the 2014-15 school year, however, I was approached by Dr. Jin Haritwarn and asked to speak on a panel for the Environmental Studies Seminar Series: “Transforming Violent Environments: Antiracist and Anti-Colonial Classrooms and Campuses.” Jin informed me that the panel was to focus on York’s campus and I thought instantly of sharing the letter I’d written in Dr. Winder’s class. I thought I should read it because Black Creek is situated right next to YorkU. After all, being the President of ASAY, it was my duty to go and speak up for the racism many York Indigenous students felt every day at school, and that some described to me after going to the village themselves. On January 20, 2015, I read my letter aloud and the crowd loved it; many people cheered; a few jumped out of their seats; some had questions; and one man approached me afterwards and asked me if I wanted to make something more of it. His name was Dr. Anders Sandberg, a full professor in York’s Environmental Studies faculty. Anders told me that he believed the letter would make a good short film and book chapter and that he could use it for his “Jane’s Walk: Alternative Campus Tours.” The Alternate Campus Tour showcases local history on and around the York campus. Anders then invited me to be a tour guide on one of his Jane’s Walks in June 2015 and I took him up on the offer. A few months passed and it looked like the letter would go back into my desk drawer and collect dust. That is, until Anders called me up one summer day in July and said that he’d found someone to direct the film and that we’d better meet in his office to plan it out. The filmmaker was Dr. Martha Steigman, a recent hire in YorkU’s faculty of Environmental Studies. Martha was an established filmmaker with connections in Montreal and who had made films with many Indigenous communities in northern Quebec and in the Maritimes. In that July meeting the three of us schemed. We planned out a script writing session, charted out how we could make a book chapter based loosely off the information in the letter, and how we could confront the problematic history presented in places like Black Creek. At the end of it, Martha and I were to do the script and film, while Anders was to focus on the book chapter for his upcoming edited collection, Methodological Challenges in Nature-Culture and Environmental History Research. The book materialized, relatively quickly, after Anders and I did a reconnaissance mission in the site collecting data for our piece. In consultation with Martha and I, Anders toiled away on the book chapter for seven months. “But where am I? : Reflections on digital activism promoting Indigenous peoples’ presence in a Canadian heritage village” was published earlier in 2017. The filming for the project took much longer than anticipated, one year, for which Anders and Martha got internal funds from the Faculty of Environmental Studies at York. The overextended filming happened largely because we could not secure permits to film at Black Creek in a timely fashion before the fall season ended (the village closes in winter). Martha’s director’s eye brought to life my words and made them into beautiful images. The film launched nationally last week (on June 27, 2017) on the National Screen Institute website and is currently going “viral” online, a testament that others in Canada feel we must fix our broken and exclusionary public history and education institutions and start recognizing that Indigenous peoples were here first and thus have an inherent right to the land. For what it’s worth, with York University history professor Jennifer Bonnell, I met with Black Creek’s managing directors in October 2016. I showed them the film and things look hopeful currently. The people at Black Creek were moved by the personal angle of kiskisiwin, and Dr. Bonnell, to the best of my knowledge, has been working with Black Creek to change their narrative and integrate Indigenous peoples into their onsite history displays, not just in the gift shop. L. Anders Sandberg, Martha Stiegman, and Jesse Thistle, “But where am I?” Reflections on digital activism promoting Indigenous peoples’ presence in a Canadian heritage village,” Methodological Challenges in Nature-Culture and Environmental History Research. Eds. Jocelyn Thorpe, Stephanie Rutherford, and L. Anders Sandberg (New York: Routledge, 2017). My favourite take on historic sites struggle to present their Indigenous history in this context is: PLAYING OURSELVES: Interpreting Native Histories at Historic Reconstructions by Laura Peers. New York: Altamira Press, a division of Rowman & Littlefield Publishers, Inc. 2007. Thanks Paul, I will definately check out Peers’s book.